We’ve been loving every second of our beach vacation, even the rainy ones, like today. After pinning until my index finger got sore and reading through every magazine I had brought, I made my yearly pilgrimage to Atlantic Spice Company, an Outer Cape classic. We weren’t the only ones using the rain as an excuse – the place was mobbed. Bored beachgoers with wallets on a drizzly day – I hope Atlantic had a killer day of sales. 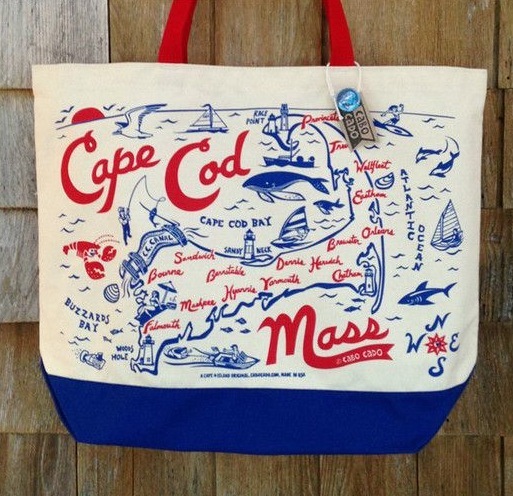 I contributed to that and bought (among another $110 of things, oops) this rockin’ tote by Cabo Cado. The founder is an illustrator and lobster man living on the Cape – majorly multi-talented – and he perfectly captured the Cape’s highlights (also does ones for Martha’s Vineyard and Nantucket). My new beach tote will be christened with some sand when the sun comes back out tomorrow!